Rauch sat down to interview Woods on a variety of subjects—including Gotch culture, perpetual war, the joys of smoking, and the genesis of TtDWYGitC. Read an excerpt below, and check out the whole interview here. 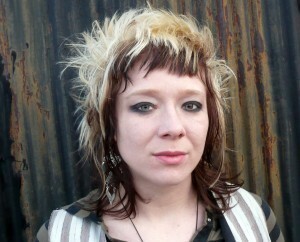 Sara Rauch: The stories in Things to Do When You’re Goth in the Country are fantastic as stand-alone pieces, but they also feel like they’re in conversation with one another, which makes the collection work really well as a whole. How did you choose what to include? 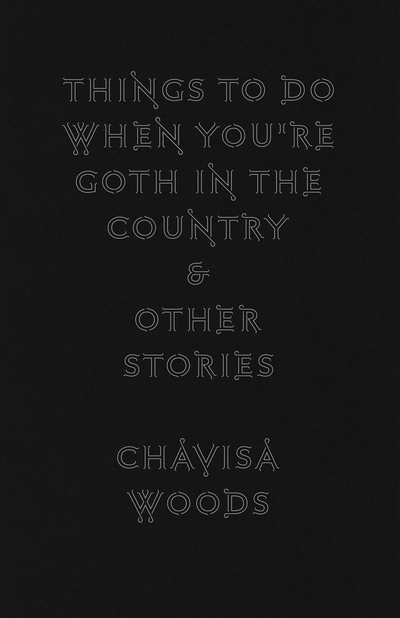 Chavisa Woods: I wrote these eight stories with the collection in mind. All of the stories, you may have noticed, include a war, sometimes at the forefront, and sometimes at the periphery, but a war is always there. There are characters dealing with both Iraq wars, the war in Afghanistan, the Israeli occupation of Palestine, as well as the religious “war between good and evil,” the war on drugs, and class warfare. This was an integral part of the book for a number of reasons. Ongoing, and unacknowledged war is somewhat a benchmark of American culture, and this is definitely a book about America. The war theme, also, strangely, plays into the goth theme. One of the main characters, the girl in the titular story, is obsessed with the war in Iraq and Afghanistan, and feels the impact of the violence of that war very deeply, and references it as a reason she dresses goth. She is reflecting the gruesome death her country is responsible for, that she also feels responsible for, and wants it to be visible. In 2011 and 2012, I saw several articles about emo and goth scenes emerging in Iraq, among teenagers and young adults, and they specifically reference the war and all the death they saw every day as being an influence on their aesthetic, so I was also thinking about that when I wrote the title story. I was thinking about goth as a sort of costuming that sometimes works to make uncomfortable realities visible. All of these stories also, are about someone being very out of place. Most people in the book find themselves places they don’t belong, often, the places they were born. When I wrote all of these stories, I was thinking about all the very specific elements that make up the poor, rural heartland, and I really wanted to paint a full picture of something very uniquely American, these eccentric individuals who feel out of place in their own home, and who are willing to see and experience and acknowledge what is happening in a way the people around them are unwilling to do. SR: The collection opens with cigarette smoking and closes with cigarette smoking—and this really struck me. In the opening story, cigarettes are a means to avoid asking questions and in the closing, title story, cigarettes are “something to do.” But is there something more here, something metaphorical or symbolic in all this smoke? CW: Absolutely. Cigarettes are very cool, they give a person an edge, they are rebellious, and even relaxing, but they are also self-mutilation. And, nowadays, they are mostly the vice of the working class and poor. I love smoking. It’s one of my favorite things in the world. But I also have asthma, and smoking makes me very, very sick, and I have had to quit. But it’s a struggle. Even just writing about it now, I want a cigarette. I feel most grounded and calm when I’m smoking, but it’s also killing me. And when I go home to visit, that is when it’s the hardest not to smoke. I’m from a small, very rural town of 1,000 people. I have family there who I love and many terrific close friends there. So I spend a few weeks a year there. But, still everything else is still there too, all the things that were hard to deal with as a kid. There are very, very poor people who are in a lot of pain, and dealing with very difficult situations on a daily basis, whom I’m also close to. There is an active KKK in the county. I go out to bars to drink, and there are very racist, sexist and homophobic people around me, and you know, it’s nerve-wracking. I hear some pretty horrible things when I go out. Some of it is hard to take in. I usually end up breaking down and smoking there and also making myself sick. And a lot of people from there smoke, and they smoke a lot. And I understand why. Especially people struggling with very severe poverty. They smoke a lot because it’s like something they can do to alleviate stress and anxiety. They can’t take a vacation, or go to a spa or get a massage, or go to therapy. But they can smoke. It’s an affordable little thing they can give themselves as a treat, but it’s also killing them. And I think that is a big metaphor; the thing that the poorest people are doing to get through the things that are hurting them, is also totally deadly. There are a lot of different types of physical and psychological self-mutilation in Things to Do When You’re Goth in the Country. Chain-smoking is one of the primary means of this. And that’s because it is both a thing that allows the characters to endure some of what they endure, but also, they probably wouldn’t need to smoke so much if they weren’t enduring these horrible things, right? Smoking in many parts of these stories is a sign that something is wrong. Something upsetting happens, the character reaches for a cigarette. “I need a smoke,” you know? People say that when they need to calm down. So smoking is the physical manifestation of everything they are dealing with. It is self-mutilation, which is just a means of making an emotional pain, physical. And smoking is a long-form self-mutilation. It is nearly constant, it occurs all throughout the day and has a cumulative effect, which is also how living in poverty or in hostile environments impacts a person. So, smoking is really just a metaphor for the daily lives of many of these characters.